Their mother is an English Lop and their father is a Giant. I’ve never seen the father so I don’t know exactly how big he is but it is definitely going to be interesting to see what size the girls grow to over the next year. The day we brought them home was great 🙂 and the boys couldn’t believe that they actually had their very own rabbits. They took to them straight away and I was relieved that there was no arguing over who had which one…phew! Our eldest picked the ginger rabbit and named her Baller or ‘B’ for short (he’s football mad) and our youngest picked the white and brown rabbit and called her Hop. 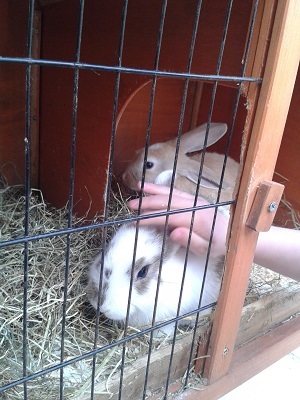 I would definitely recommend rabbits as a first pet for young children, they are not too small so they are able to have cuddles and stroke them easily and fortunately the home they came from had held them every day since birth so they both have a lovely nature. It has also been nice to see how the boys have learned to be gentle and calm around them (this is a very big deal for our boisterous boys), our youngest Malachi especially has developed a real love for all animals and according to Isaac our house now needs to be filled with pets! A big shock for me was their willingness to help with cleaning them out and sweeping up the yard, let’s just hope that it carries on. We currently live in a Victorian terraced house with a flagged yard out the back. At the moment the rabbits are in a standard hutch which will need upgrading soon as it is only really suitable for one large rabbit, they do however have free run of the yard every day which they love. There are plenty of shady areas for those beautiful hot sunny days and the hutch door is always left open in case they want some shelter or a bit of peace and quiet. We lock them in the hutch each night at around 12:00 to protect them from any wandering cats and then they are out again before 7:00 each morning. This is why I am looking into a range of hutches that are 2 tiered with a run attached so that they can have a run and jump whenever they want to without them being in any danger from the night time wildlife. I would prefer a raised hutch because it would mean that the rabbits could have a safe place to play through the night that doesn’t take any extra space in the yard from my boys to play in. so watch this space for information on getting the right hutch and possibly a review of the one we eventually choose.